crème brûlée is about as perfect as dessert can get. i had never had crème brûlée until our recent trip to cincinnati. we ate at jeff ruby’s and it was so heavenly, i decided that i needed to figure out how to make it! i picked up a crème brûlée torch set from bed, bath & beyond, butane from meijers, and was on my way to making the recipe below. i hope that you enjoy it! bring a large pot of water to boil. while the water is boiling, combine cream, 1.4 c sugar and salt in a saucepan over medium heat. stir occasionally 4 to 5 minutes, until steam rises. in a medium bowl, beat egg yolks and vanilla until smooth. temper hot cream into yolks, stirring constantly, until all cream is incorporated. pour mixture into ramekins. 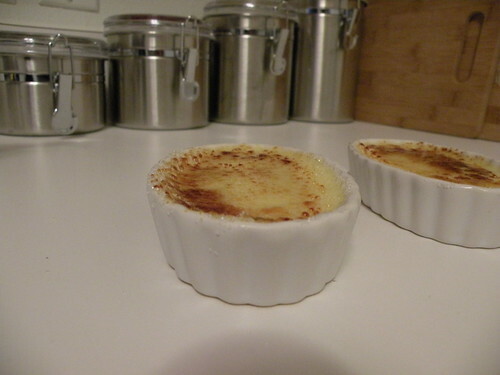 place ramekins in baking dish, and place dish on oven rack. pour boiling water into dish to halfway up the sides of the ramekins. cover whole pan loosely with foil. before serving, sprinkle 1 tbsp sugar over each custard. use brown sugar for a caramel flavor, use white for a crunchier topping. brown top. We should try chocolate crème brûlée next! Wow, this is a wonderful find. I didn’t know you blogged. It is just like the movie Julie and Julia. I bet you’ve seen that. Wonderful to see your recipes and I am going to try some. Love ya oodles!! I have not watched Julie and Julia yet, but it is in my Netflix queue and should be here tomorrow. You’ll have to let me know how the recipes work out for you. 🙂 <3 you, too!